Zhu Laober is the third generation of artist who comes from a long line of painters. 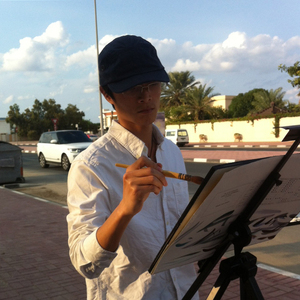 He mainly works on watercolor painting and digital painting. After got BA of digital design from Yangzi Normal University in 2009, he participated in several projects in China as concept artist and art director, including feature film, animation film, documentary etc. His painting Little David was shown in the 2013 SURGE Affordable Art Fair in Shanghai; his series of watercolor paintings impression. Dubai were shown in Dubai SIKKA Art Fair 2014. Traveling years and project experience made him mature and keen. Gradually, he formed his own philosophy and tried to find a medium which is close to nature. Effected by his father who is an artist of Chinese painting and several contemporary masters, finally he chose watercolor. He keeps on painting on locations to capture light and mood and tell stories by visual language. His watercolor paintings are not copies of landscape or people, but vivid scenes of life.With the developing of skills, he is now free to express the aesthetic of the world from his point of view.